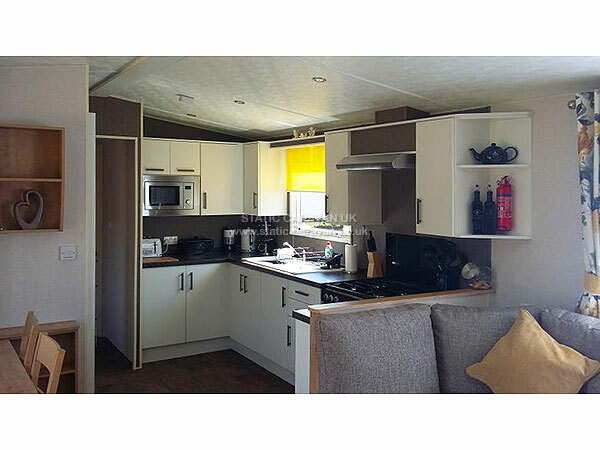 Our Platinum Caravan is a 2 bedroom model made in 2017. 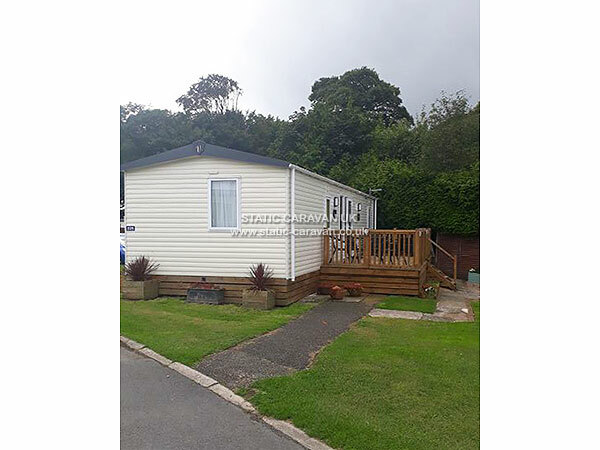 It has a lounge in the centre of the caravan with a bedroom at either end, it is fully double glazed and centrally heated situated on a lovely family friendly site between the picturesque towns of Looe & Polperro. With the beautiful sandy beach of Looe only 2.5 miles away. 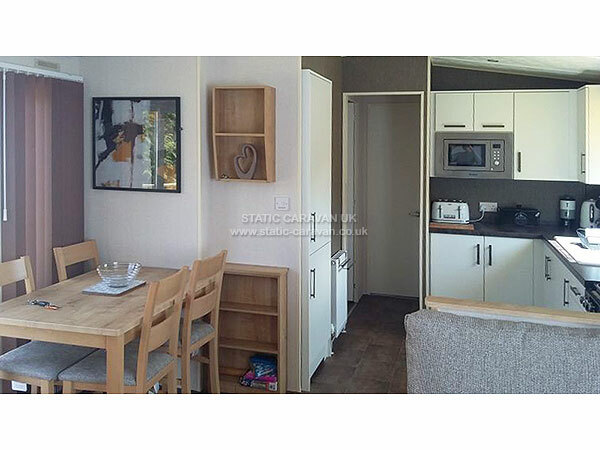 The spacious living area is open plan and provides a perfect family gathering place, this consists of the kitchen area which is fully equipped with built in cooker. A full size built in fridge freezer. Built in Microwave oven. kettle and toaster. An ironing board and iron, hairdryer and vacuum cleaner are also available for your use. 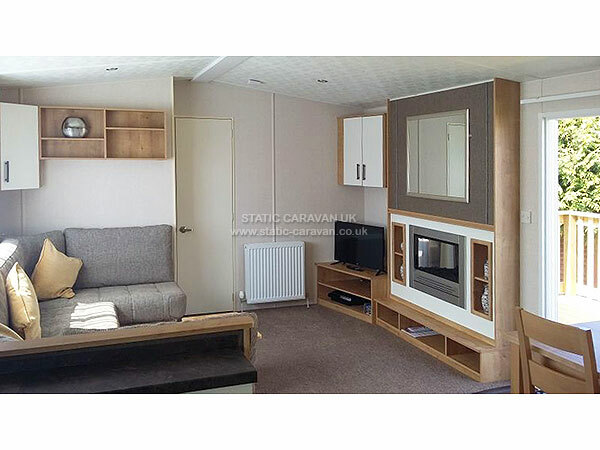 The lounge area is spacious with an electric fire, 32" flat screen TV with free view & DVD player. 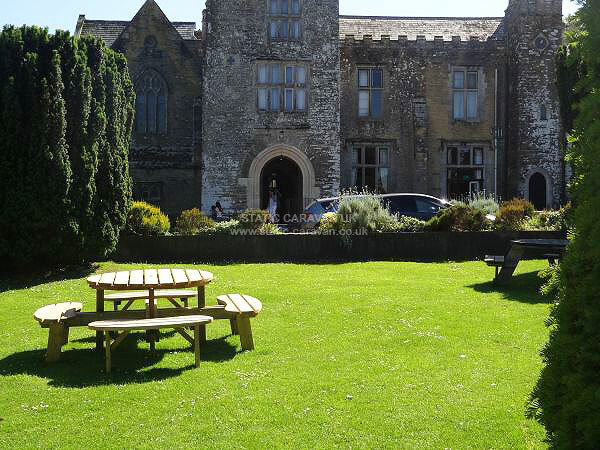 The pullout double bed can be found under the seating in this area . The Dining area consists of a dining table and 4 chairs. 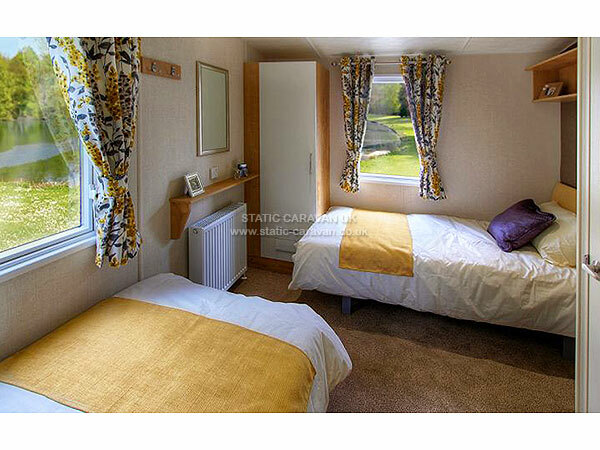 Bedroom 1 is a double bedroom and bedroom 2 is a very spacious twin with full size 3ft single beds. Duvets, pillows & bed linen are provided. 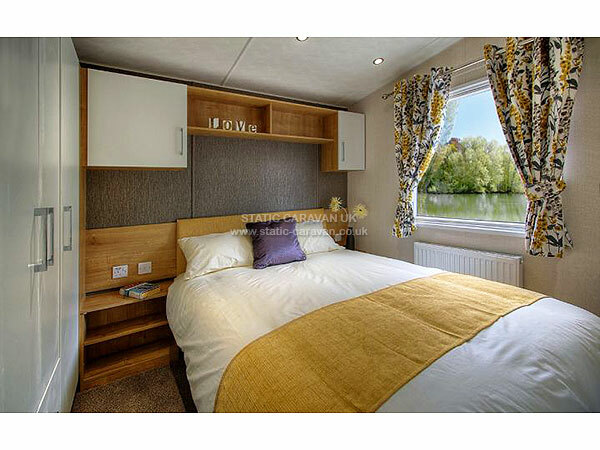 Bedroom 1 has an ensuite shower room with a toilet and wash hand basin, and a wall mounted TV, while bedroom 2 also has an ensuite shower room with a toilet and wash hand basin, and a door which leads into the main living area..
GAS & ELECTRIC are both included in the weekly price. Smoke detectors, carbon monoxide alarm and a fire extinguisher are installed. All equipment has been professionally tested. 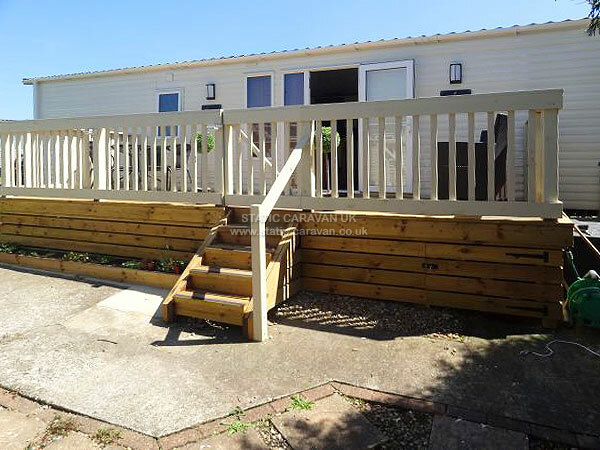 The front door leads onto a spacious decked balcony, which runs alongside the caravan and houses a patio set, and 2 chairs with coffee table for you to enjoy the outdoors. The deck has a gate so that your small children can play out on it and stay safe. 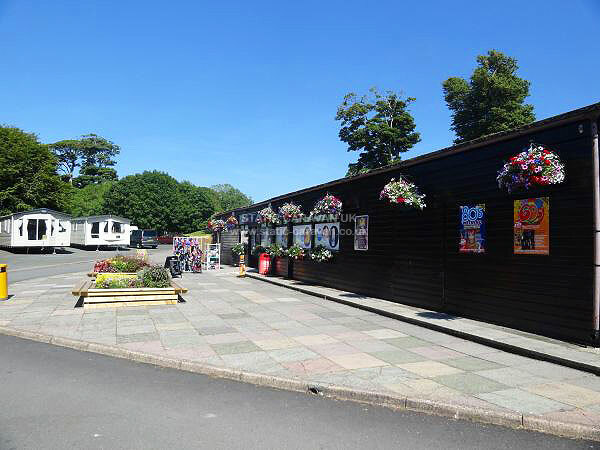 We also have a patio area with picnic bench next to the caravan, this is the area where you can use your own disposable barbecue, not on the balcony please. USB points on most of the sockets in the bedrooms and lounge. Keys will be available from the key safe at the caravan from 4pm on day of arrival. Key code will be provided once payment has been made in full. Please vacate by 10am on the day of departure. A £100 non-refundable deposit per week is required to secure your booking with the total balance being payable 4 weeks prior to your holiday. SHOULD THE BALANCE NOT BE PAID 4 WEEKS PRIOR TO YOUR HOLIDAY, THEN WE WILL CONSIDER THE BOOKING CANCELLED AND IT WILL BE OFFERED TO OTHER CLIENTS. 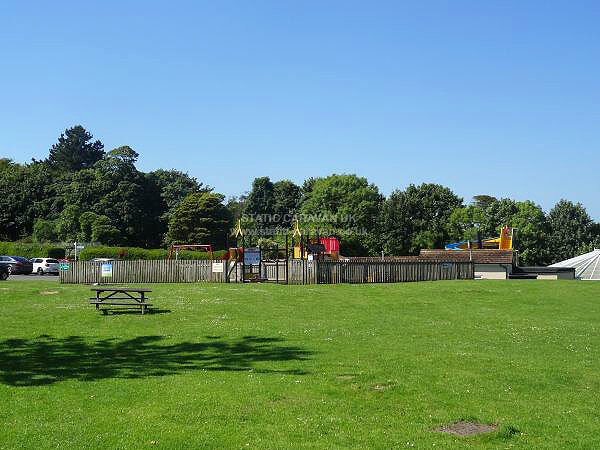 Bookings made less than 4 weeks in advance will require full payment to secure your booking. Payment can be made by cheque, bank transfer or PayPal. Bank and PayPal details given upon request. No all male or all female groups are accepted. Sorry but pets are NOT allowed under any circumstances. 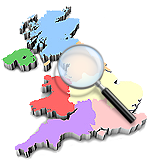 Any damage or breakages incurred during the occupancy must be brought to the attention of the owner before vacating and may be subject to charge.